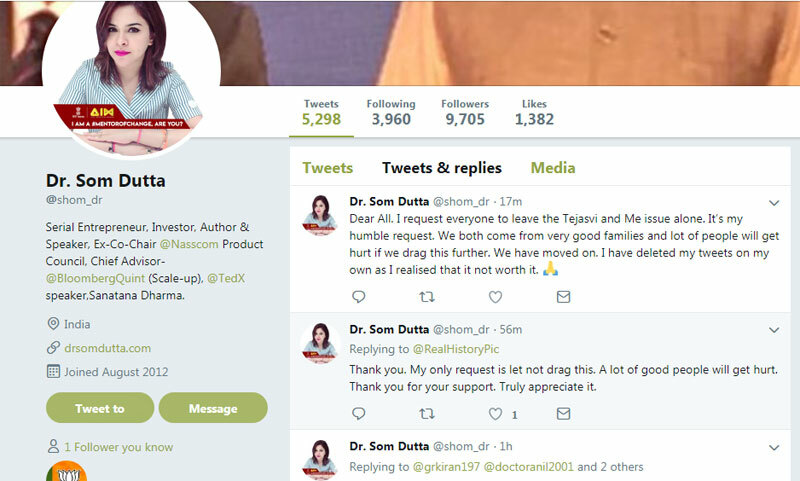 Following the announcement of Tejasvi Surya as the Bangalore South candidate for the BJP, a businesswoman, Som Dutta took to Twitter to share some grisly details about him. As a response to this allegation, Tejasvi Surya said he respects the women and don't want to go further. In a series of tweets, which are since inaccessible, she accused the BJP candidate of being a 'womaniser, abuser and woman beater' and asked people if they wanted to 'blindly support him'. Dutta said that she suffered for over five years before she made it stop by taking serious measures. She said that she was not his first victim, nor his last. Her tweets were shared by the Karnataka Congress, which asked if Tejasvi was another M J Akbar in the making and said that Bangalore South will remember the candidature. Is @Tejasvi_Surya another MJ Akbar in the making? However, after her tweets went viral, she deleted them and put up a tweet asking people to leave the issue alone, as they are both from good families and people will get hurt if the matter is dragged further. At this time, her Twitter profile appears to be inactive. Tejasvi was fielded by the BJP on Tuesday for the Bangalore South Lok Sabha constituency. His candidature has not gone down well with state BJP functionaries with some demanding an explanation before committing to any campaigning. "Dr Som Dutta is a close friend of mine. She herself deleted the tweets that were against me. Further, she has also requested everybody not to continue this any further. As a gentleman, it is my utmost duty to respect her words and I will not continue this any further," Surya said.